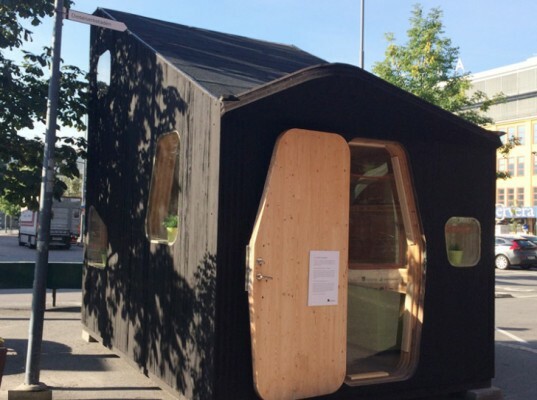 The tiny house revolution is hitting the college set. Swedish design firm Tengbom Architects designed a portable micro-dorm room that gives students privacy while upholding sustainable living. Called the 10 Smart Square dorms, each unit provides 107-square-feet of living space with an efficient design that allows students to enjoy all the comforts of home in their tiny dorm. Designed for Sweden’s Lund University, the project was created to develop sustainable smart housing for students that would not only offer a comfortable living option, but also set a precedent for sustainability in the university setting. The mobile units are constructed entirely from timber, supplied by wood manufacturer Martinsons, and feature a sleeping loft, kitchen, living and dining areas, all of which can be moved easily. Each unit can be assembled on-site in just a few days, and yield little construction waste. The units can be arranged together, or moved to other parts of the campus easily with a tow hook up. Finished cross-laminated timber clad both the interior and exterior, making for a neutral palette that makes the inside feel roomier. Built-in shelves are in-set throughout for optimal storage, as well as a fold-down desk and countertop dining areas. Each unit also boasts a tiny bathroom and shower combo. Thus far, the first unit was built and displayed at the Virserum Art Museum, but Tengbom plans to build 22 more units this year for students to move in. Aside from having their own home, the students can also expect to pay about 50 percent less on the micro unit than they would on regular dorm rooms. How about putting this on a trailer?